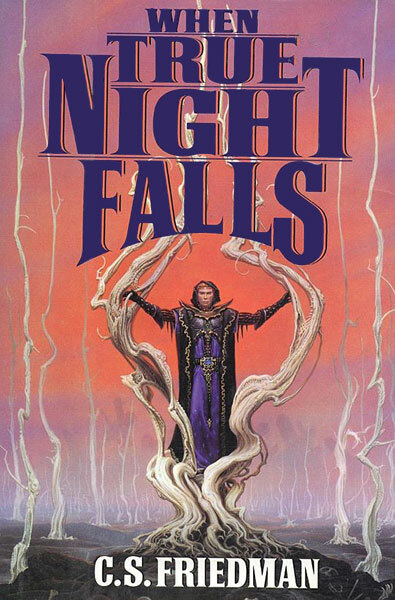 When True Night Falls returns to Erna at a crucial time in this undeclared war. Over the years, five attempts have been made to cross the planet’s greatest ocean and settle the lands in the east. But the Novatlantic Divide, riddled with active volcanoes and fae-born dangers, has apparently swallowed each expedition in its turn, leaving the fates of these explorers forever veiled in mystery. Determined to seek out and destroy the source of the ever-strengthening evil he sought in Black Sun Rising, Damien Vryce, the warrior priest, has renewed his uneasy and dangerous alliance with Gerald Tarrant, the immortal sorcerer known as the Hunter, and together with Hesseth, a woman of Erna’s native species, the rakh, they will dare the treacherous ocean crossing. But the crossing may well prove to be the least of their worries. For though the eastern continent has indeed been settled by those who went before them and appears to be a haven of peace, this image of paradise masks an evil that threatens the very essence of the human spirit. And, forced to flee south into realms long since abandoned to the dark fae and its creatures, Damien and Tarrant will soon confront far more dangerous foes, enemies who almost seem to await their coming. Lost in a land where those who offer hope of salvation may prove to be the true masters of treachery, and steadily drawn toward a rendezvous which may rob them of that which is even more precious than life, will Damien, Tarrant, and Hesseth find their own alliance shattered by power out to possess or destroy all of humankind?